While online trading is a very enjoyable and generally accessible medium for accessing the market, there are some factors which you will need to get perfected before you can begin online trading and making proper strides in this world. For example, getting the perfect online trading website, one such as Weiss Finance. This is the kind of trading platform which directly provides a lot of the components needed to make a success out of your online trading efforts. Some things, however, can only be tied down by you, so let us make sure that you know exactly where to start when it comes to finalizing your first exciting venture into the market. You need to find the right trading style that matches your lifestyle, mindset, and overall skills and strengths – that is a given. But did you know that your broker also needs to match your trading style? The kinds of online stock that you wish to trade heavily impacts which kind of broker you would ideally like to have on your side. You will indeed need a very sophisticated technological medium if you wish to enter the frantic day trading sector. Day traders will indeed need the best brokers that they can find, as the speeds that activities happen in this sector of the market require lightning-fast access and reactions. There is much that you may potentially miss out on in the event that you do not have the proper facilities, and a lot of money you could potentially miss out on. On the other hand, those that prefer to engage in short-term daily, weekly, and monthly trading styles can make the most out of the less advanced or sophisticated brokers available. As you can imagine, when it comes to fees, the brokers suited for day trading will be the most expensive, while the short-term brokers will be relatively more affordable. Everyone knows that trading stock is a risky business. A lot of people will seriously hurt their trading accounts prior to making any money and knowing what it means to even win once. These are the people that have failed to factor in risk management into their trading strategies. A lot of people like to think of stock trading as some kind of glamorous and daring venture, in which a lot of money can be made if you just follow in the footsteps of whichever idol you happen to look up to. The truth is that stock trading is mostly about how well you can manage your risk, and how much damage you can control. While there is indeed a lot of fun and thrilling activity to be had in the market, the best traders are those who have developed an almost sixth-sense like understanding of risk. While you may believe that you have a foolproof trading method nailed down, if it does not suit the market that you wish to enter, it could end up being useless – and not only unsuitable – but detrimental to your capital as well. No matter which market you happen to go into – you always need to make sure that what you are bringing to the table will work with the environment. A lot of people are under the impression that a market can only keep going up. The truth is that markets will often go down, and there can be long periods lasting months and even years where the market can stay down. The best way forwards then is to have a trading method that can make the most out of both up-markets and down-markets. Making the most out of your stock selection is something that you will be able to pick up after a decent amount of time and experience. It takes a well trained eye to be able to pick up which stocks are the best, coupled with a lot of research. Then there are the skills you will need, which again are only acquired after having spent a lot of time trading and immersed in the stock market. Excuses, excuses, excuses. I’m seeing them on forums, blogs, and comment sections. There is always some reason why people can’t start investing today. The most widespread excuse is “I don’t have the money to start”. Today, we are going to solve that, because we’re going to show you how to turn your old junk into investments. I recently started my journey towards living frugal and have learned a great deal of lessons since beginning. One of the most important lessons is the need to invest early on in life to take advantage of compound interest and a good rate of return. The problem? I didn’t have the cash to put towards an investment. I could have made excuses, but I didn’t. Instead, I found a way to earn the cash. Is your garage littered with old junk you never use, or do you have unloved trinkets laying around your living room? If you’re anything like me, you do. 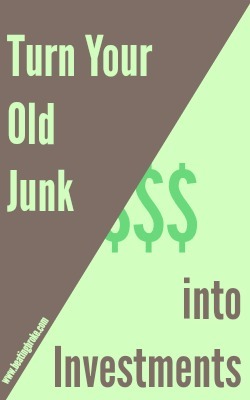 If you want to clean up your space and make some cash in the process, you could look into selling your old junk. Your trash could be another person’s treasure! You never know what people are looking for, in terms of old kitchen appliances, old tools, even old art or trinkets. Someone might be looking for a blender jar for a broken blender, and you might have one laying around from an old blender you never bothered to get rid of. Or, you maybe you recently upgraded your mower and you need a way to get rid of your old one. As you learn to live a more frugal life, you will realize there are cheaper ways to live a rich life than spending money on items you will only use a handful of times and then take up space in your home. Take those old mistakes into cash by selling your old stuff for cold, hard cash. Here are a few steps that I took to get cash and start investing. If you want to get cash quickly and with little hassle, you can take it to your local pawn shop. Make sure you price your stuff reasonably, otherwise they won’t take it. Have you ever watched Pawn Stars? While your items might not be as rare or unique, (or maybe they are!) most pawn shops are similar to the shop in Pawn Stars- they are most likely not going to offer you your asking price, they will price lower so they can sell higher to their next buyer. Remember, they need to make money too! Pawn shops will take anything from old jewelry to DVDs to old lawn equipment. If you have specialty items, like art or antiques, research your local pawn shops to find the place that will give you the most money for them. Don’t get sellers remorse at the last second though, they may not be willing to sell it back to you! The thought of a pawn shop may be too impersonal, and if so that is okay! You could always sell your stuff at a garage sale. This requires a little more planning- you will want to make signs and price your items individually like a department store. You will also want to enlist the help of friends or family to help collect cash, answer questions, and make sure nobody walks away without paying. Garage sales can attract all sorts of people, including young people, families, and collectors. Some might not have the best intentions, so it is good to have a system that makes sure no buyers can walk away without paying for their items. Trust me, they will try! A garage sale gives you the opportunity to tell the story behind your pieces and watch them walk away to their new home, which is much more personal then selling them to some guy behind the counter at a pawn shop. For higher-value or larger pieces you may want to post them on Craigslist. Craigslist gives you the opportunity to reach out to more potential customers without having to ship a bulky or expensive item. If you are worried about the crazy stories you have heard about Craigslist deals going bad, you can enlist the help of a friend or family member to accompany you. Don’t meet buyers at your house or late at night. It is preferable to meet them in a neutral location, such as a parking lot or mall, with a friend or family member with you. Make sure to ask the potential buyer to bring cash- do not accept checks, money orders, or anything else! There are plenty of scammers mucking about on Craigslist, but there are also plenty of serious buyers. Ebay is perfect for smaller items, like kitchen appliances, clothes, jewelry, and trinkets. People from all over the world use this website and are usually excited to find pieces that are just exactly what they are looking for. You can give buyers the opportunity to bid on your items, or simply buy them outright. The only drawback of Ebay is that you will have to ship the items. Be sure to build the cost of shipping into your price, and be sure to pack your items securely! The last thing you want is for the item to arrive to the buyer broken. This can be an amazing opportunity to reach buyers all over the world. You really never know what people in Michigan, France, or Thailand are looking for- it could be exactly what you have in your hot little hands. Selling your items online or in-person can add some extra cash to your pockets. Now that you have it, download the Robinhood app from the iPhone or Android store. The Robinhood app allows you to start trading with as little as $1. And the trades are free. Don’t let sentimentality destroy your future! Start investing now. I promise, that old lawnmower or ugly pillow you got as a gift aren’t worth keeping. You may not get full retail price, but you will get more than you have in your pockets right now. Passive income is the best income. I frequently argue this case to the readers of my personal finance blog. Passive income is money that comes my way based upon work that I’ve done in the past. It might come from an article or a blog post that I wrote years ago, or it might come from a dividend-paying stock that I bought a couple of months ago. It comes in whether I decide to work hard on a given day or I choose to sleep in and watch a football game. Most people think that more work is required for additional income, but passive income requires no additional effort on my part. This is why I think passive income is the best type of income to have and I want to build it up over time. When thinking of passive income and how to increase it, I’ve decided that dividend income is the best passive income. Here are four reasons why I’ve come to this conclusion. When many people think of investing in stocks, they don’t really have investing in mind. They tend to picture greedy men in suits running around on Wall Street or day traders sitting in their living room who try to make quick trades to cash in capital gains. This is trading in the best-case scenario and speculating at worst. People who are actual investors find a company that they like that has solid revenue and income streams. They generally intend to hold a stock for the long run. Warren Buffett, possibly the greatest investor ever, argues that his ideal holding period is forever. Investors understand that the stock of a company they choose might go up $2 one day and down $4 the next. In a recession, most stocks will get hit. This does not mean that the underlying fundamentals of a given company are necessarily bad. It could just mean that stocks are on sale. Many companies that make a nice level of income over time decide to pay a portion of their profits back to investors in the form of a dividend. This is actual cash that can be used in any way a shareholder might decide, and depending upon the amount of the dividend and any growth in that dividend over time, an investor could actually see all of their original capital returned to them, and then some. This all happens while the investor continues to own a portion of the company. If the company has the growing revenue and income over time that is necessary to support a growing dividend, it’s also likely that the price of the stock will appreciate. This is a win-win situation for the shareholder. There are basically two ways that an investor who decides to reinvest dividends can do so. The first option is to sign up for a dividend reinvestment program, otherwise known as a DRIP. A DRIP buys additional shares in the company that paid out the dividend. For example, a hypothetical company might have a share price of $100 and a quarterly dividend payment of $1. For every 100 shares that an investor holds, he or she would get one additional share the first quarter. An investor with 50 shares would receive one-half of a share. This process is usually available for those who buy shares directly from a company, but it is also available through many brokerages. Charles Schwab, Fidelity, and TradeKing are just three of the online discount brokerages that allow for DRIPs. All that the investor has to do to DRIP is inform the company or brokerage that they want to. There might be a request form, but it’s usually a pretty painless process. The second option for those who want to reinvest their dividends is to collect dividends from all companies that they own and then make a purchase when the pool of dividend payments gets to a certain pre-determined level, be it $500, $5,000, or anything in between. They could also choose to jump on a great company at a great price if the opportunity arises before reaching the ideal amount of pooled dividends. This reinvestment can go toward a company that the investor already owns, or it can go toward diversifying into a new company. Regardless, it is a deployment of new capital that can bring more passive income over time. In the interest of full disclosure, I’ve used both of these methods for reinvestment at different times. I’m currently pooling my dividends, rather than allowing them to automatically reinvest into the company that paid them, but I am not fundamentally opposed to DRIPs. There are several publicly traded companies that have grown their dividends for 25 years or longer. Even better, there are a few that have a dividend growth record of at least 50 years. Both Johnson & Johnson and Coca-Cola have grown their dividends every year since the Kennedy administration. Getting a dividend increase each year is essentially getting a raise on your passive income that will oftentimes exceed the amount of any raises your regular employer will give you. When trying to find a solid dividend growth company, it’s a good idea to look at metrics like income growth, revenue growth, and dividend payout ratio (the percentage of profit that’s paid out to investors). Growing income and revenue are good signs. A relatively low dividend payout ratio is a good sign, as well. I’ve seen investors who want a ratio of below 50 percent. Others are comfortable with a payout ratio of 80 percent. Regardless, lower payout ratios are generally better. 4. The Combination Of Reinvestment And Dividend Growth Can Lead To A Compounding Stream Of Passive Income. Putting dividend growth and reinvestment together can lead to a supercharging of your passive income stream. Reinvesting a dividend effectively increases your dividend payment by the current yield. For example, if the current yield is 4 percent, an investor who initially had 100 shares would have slightly more than 104 shares after a year (because of compounding), and the dividend payment for the next year would be more than 4 percent higher (and growing because of compounding). After two years, she would have more than 108 shares, and so on. This example assumes a stable dividend and share price. Dividend income would double in about 18 years in this scenario based upon the rule of 72. When the dividend grows, however, the passive income stream would increase even more rapidly. With the example given above, the dividend yield and the rate of the dividend increase would get added together to calculate the overall increase in dividend income on a year-over-year basis. The 4 percent dividend yield, if combined with a 6 percent increase, would effectively lead to a more than 10 percent increase over the course of a year (keep in mind that compounding is in play every time a dividend gets reinvested). If this process could continue for about 10 years, based upon the rule of 72, our hypothetical investor would see his income grow from $100 to roughly $200. This all happens with no new investments outside of reinvested dividends, which is why I believe dividend income is the best passive income. While I firmly believe that dividend income investing is a great way to build wealth over time, investors should perform due diligence when putting available capital toward equities. Dividend cuts definitely happen, and from time to time dividends are suspended altogether. Companies can also go belly up. These are all risks that come with investment although diversifying across companies that have solid financials and reasonable payout ratios can limit the possible risk and make it more likely that a dividend investor can succeed over the long term. This article is intended for educational and informational purposes and is not intended as a recommendation to purchase any particular investment. Be sure to perform due diligence before putting money toward any investment.